Being a small business or a midsized business, you cannot afford to splash in advertising. Perhaps you have always believed that small is not your type. This is high time, you discard myths and start promoting your brand through these effective promotional square magnets. They may not offer you benefit of 1000 impressions in a day, but they would bring you one quality customer a day or perhaps a week, who may bring 1000 other customers in a year. By gifting these customized magnets, you can easily stand out from other competitors who have invested in big promotional items. People are getting bored of seeing big promotional banners and billboards. They do feel that it is a pure waste of time and resources. However, a small full color promotional magnet may easily assume the role of a refrigerator art. As you know customization or personalization is the real aspect of branding and the whole process is damn expensive. 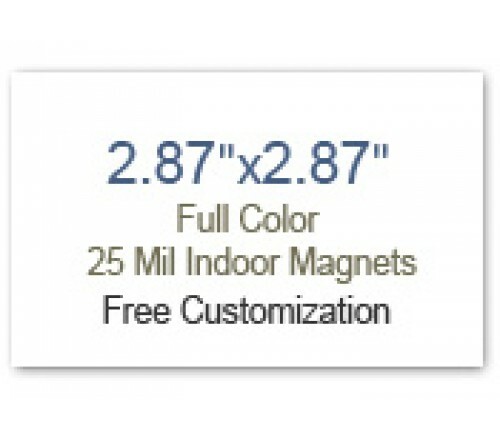 With magnet advertising, you can stay cool about customization because many online stores are offering them free. You can avail benefits on free online design proof, free art set up and free full color printing. Doesn’t that sound amazing? Perhaps if you are working in print or other digital marketing mediums, they make you pay for every single favor that you seek. Full color 2.87 x 2.87 customized magnets give you the opportunity to make impressions on the crowd. They allow you to reach out to your targeted customers in a very efficient and effective way. You can purchase them in bulk and seek attractive savings on them. If you are purchasing it from eCommerce stores selling only promotional magnets made in USA, perhaps you are buying an item, which imparts credibility to your brand. You can buy these customized magnets in bulk and store them for future gifting, too. Being light in weight, you can easily carry them to the tradeshow venues or other marketing events, where crowds may swarm to your stall to see what you have to offer them. If you believed that those lip smacking candies and pens were the lowest value items, you’re wrong because people aren’t really moved by them. They may soon forget it after the usage. However, a promotional magnet will continue to remind them about your business and your efforts to strike with them. By not deciding to invest in 2.87 x 2.87 magnets, you are actually missing the opportunity to square your business information in their minds and wasting lots of money!